With the picturesque old market town of St. Rémy at its heart and the pine-covered slopes and limestone peaks of the Alpilles mountain range humming with the sound of cicadas during the height of summer, plus its wealth of historical sites and artistic associations, this area for many epitomises Provence. Controllé olive oil to the many good wines produced by a wide choice of domaines and this rich agricultural area produces the tastiest of fruit and vegetables. Many artists have studios here inspired by the landscape and light which attracted Van Gogh to spend his time here in St. Rémy and Arles. It is great too for walking, cycling and relaxing with a picnic under the heavenly scent of the pine trees and wild herbs of the countryside. 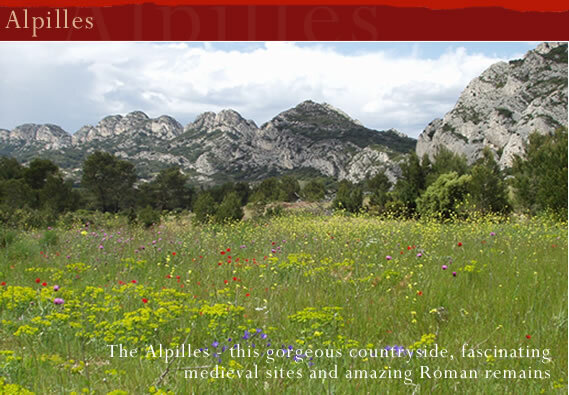 Visit this beautiful region of Provence, click >>Tailor Made. The stunning medieval fortified village if Les Baux sits on a limestone peak south of St. Rémy. Steeped in history the Citadel at the height of the village affords sweeping views over the vineyards and olive groves for which this area is famous. On a clear day you can even see across the Camargue to the Mediterranean sea far to the south. Follow the Olive route and spend time tasting the different types of olive oil this Appellation d'Origine Controllée area. For complete contrast try the Mouriès co-operative and the imposing Chateau d'Estoublon. Just beyond the Chateau d'Estoublon. the brooding Abbaye de Montmajour dominates the countryside near Arles with superb views right across the Camargue. Wednesday morning market in St. Rémy when the town comes alive with the scents and colours of Provence. Linens, vegetables, gourmet foods and pottery are just some of the attractions. The lively cafés invite you to linger all day soaking up the atmosphere on the boulevard. Explore also the pretty squares of the old centre with its many restaurants and charming shops. Follow the footsteps of Van Gogh through and around St. Rémy interspersed with images of the pictures he painted. Visit also the peaceful St. Paul Mausoleum where the artist spent his days. And in Arles there are several sights that were the subjects of his paintings including the garden in the Espace Van Gogh, a cultural centre and art gallery devoted to the artist. Avignon with its glorious medieval architecture and sumptuous Papal Palace and famous annual festival in July. The celebrated wines of Chateauneuf du Pape where the vineyards are covered in river pebbles from the Rhone to retain the heat of the sun. Arles with its superb Roman remains and pretty medieval streets is just 30 minutes drive away. The famous Roman theatre at Orange, the only one in the world with its stage wall still standing. The fascinating old town of Nimes. Spend a day exploring the Camargue where you could include the Parc Ornithologic for those famous pink flamingos. For a day by the seaside, St. Maries de la Mer is around 1 hour's drive.